As you may (or may not) know variables in Basic+ are passed to stored procedures “by reference”, meaning that if you change a passed variable in the called procedure, that change is reflected in the calling routine (a fuller explanation of how this works can be found here). This behavior is critical to the way many system functions work (such as iconv and oconv) and is very useful in returning more than one item of data from a called procedure. When you call a stored procedure in this way the system eventually passes your request to a routine called ExecNpHandler() which dispatches the event and its arguments to the desired target, However at this point the pass-by-reference chain gets broken because a copy of the argument is passed to the stored procedure rather than the original. 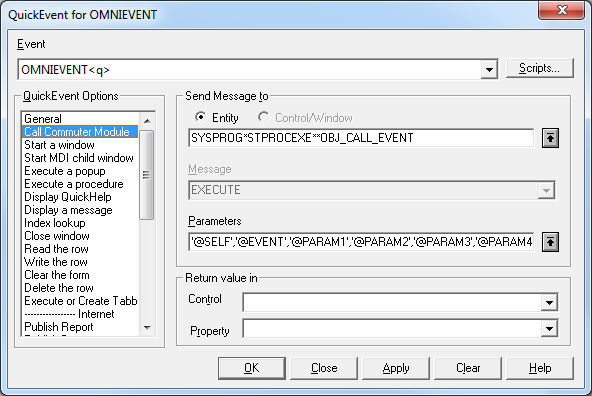 For example, if we used Send_Event() to trigger the OMNIEVENT event in the above example, and the commuter module changed Param2, the Send_Event() caller would not see the change (Note that if you use an Event Script handler then passing the event arguments by reference works as you would expect, and you will see changes made to your arguments by the Event Script handler). While working on the v10 IDE this proved to be something of a problem because the framework relies on a series of OMNIEVENT calls to pass messages between various entities, and sometimes arguments are updated to let the caller know of things like state changes and suchlike. With something as complex as the IDE, writing the events as a series of Event Scripts was impractical so we took the opportunity to update ExecNpHandler() to respect the pass-by-reference paradigm instead – Now you get to see your changes in a consistent manner regardless of whether you prefer Event Scripts or QuickEvents. You changed the arguments passed to you in the commuter module, either by carelessness or design. In this set of circumstances you will probably see an effect, and you may have to modify your code accordingly. This entry was posted in Presentation Server and tagged Events on April 28, 2014 by Captain C.